"I just got this today, it's great! Sometimes, the simple tricks are the best. I've already shown it to some people, and it really DOES get a big laugh. Thanks!" - Dave D.
Effect: Here is a very novel comedy close-up prediction effect that your spectators haven’t seen before. Almost everyone carries a cell phone nowadays, and most all of the cell phones have a calculator. 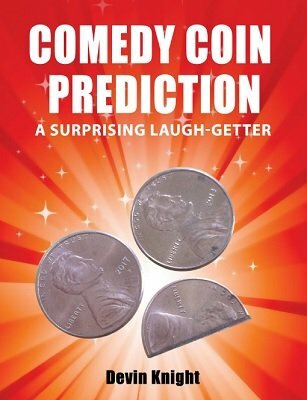 Tell your spectator that you have made a prediction and that it is contained inside a small coin envelope. Tell him the envelope contains some coins that will predict a number he will create at random, from a number he secretly chooses. If the number he created at random is 17, then you tell him, the envelope will contain 17 cents. The envelope is left in full view. This sounds like an incredible feat, if the envelope contains the same amount of change that matches a number he creates, it would be amazing. Have the person open up the calculator on his phone. Have the person choose any number from 1 to 10 and enter it into his calculator. There is no force; he may choose any number he chooses. Then after a little by-play, he totals his answer. You remind him, had he chosen a different number, the answer would be different. You ask the spectator what his total is. He says 2 ½. You appear to be confused and go over the math again with him to ensure no mistake was made. The answer is indeed 2 ½! The spectators think you have failed. You ask the spectator to pick up the envelope and empty the contents onto the table. Much to his surprise, there are two pennies and a half of a penny. The envelope contained 2 ½ cents, your prediction is correct! This unexpected ending always gets a big laugh and great reaction. It is totally self-working and a clever bit of business. No skill required. Performer need not touch the cell phone at any time, as the cell phone or calculator is not gimmicked. Actually, no calculator is necessary, the by-play with his chosen number is so simple to do, it can be done in his head. Comes with full directions on how to easily make this up. Very easy to do. 1st edition 2017, 5 pages.